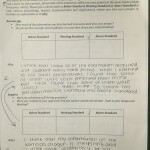 This entry was posted in Action Plan, Assessment, Feedback. Bookmark the permalink. You always impress me with your thoughtful reflections and insights. Glad Saturday was fruitful for you. Awesome stuff! Thanks so much for the insight into your feedback process. I love the sled reflection rubric that you created for your students – do you mind if I borrow it? This type of reflection will certainly help my students build their self-awareness, which is part of my action plan this year. As for fast and efficient ways to give feedback, I’ve been using docAppender with a lot of success. Another powerful feedback tool I used last year is peer critiques. I’d love to have a Hangout with you sometime to hear more about your process and ideas. Maybe @ddoucet would like to join us? @Ddoucet has been telling me about your docAppender guru’ness’ with feedback. I think a hangout would be a great idea. I’d love to see how you set it up on the back end and how you implement it. How do you use peer critiques – do you have a specific format for your class or a framework for the critique? Let’s plan a Hangout for next week. Anyone else from the Cohort want to join to learn about using forms to automate your life? Drop me a line if you do! Tim, I’ll also share some stuff about Critiques with you…. For sure, I saw your email. Thanks for sharing the critiques. I am going to tweak them for Biology and see how I can apply them to my assessments – I’ll let you know how this goes. I’m up for a hangout next week for sure. I will chat with Derek and get him in on the chat. Great to meet you on Saturday at the F2F! 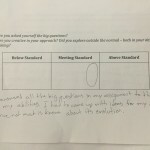 Thanks for the blog post; I think that your reflections on assessment and your action plan sound awesome, and they’re somewhat related to where I think I’ll be going with my own. Individualized, timely feedback will be key for developing a personalized learning system for my Comm Tech students. I would second the shout out to @lmcbeth and her use of DocAppender – although I’ve only just started using it, it has transformed my feedback cycle with my students. I would also encourage you to consider more non-graded assignments/tasks. I know it’s tough but the more you can get students away from thinking about “what’s my mark?” and toward thinking “how can I improve this/me?”, the better! Great to meet you too Jen! I agree about the non-marked/graded assessments! @ksolowey has put me in contact with Ryan Adams at HSC who has moved to an entirely gradeless system in History. I am looking forward to hearing about his experience. I love the idea of the blank boxes for feedback – I think the expectations for Level 3 have to be very clear and the feedback that you write in the boxes have to be very specific. Thank you for your comments! Great post Rollwagen and yes, count me in for an @lmcbeth, DocAppender hangout. I really dig the process of feedback and reflection that you’re describing, and I’m inspired by the amazing initiatives you’re taking in your practice. Also, have you added a layer of reflection after the culmination and, perhaps, the final round of feedback? Where students are directed back to the process in the continuous construction of answers to some of the larger questions (who am I as a learner?) towards ‘self actualization’. Would love to hear how that’s being explored by other teachers and would be happy to talk about what that currently looks like in my class. Thanks for the response Graham! Always a pleasure to see your name come up! Great insights as well. I am working, albeit slowly, on infusing more reflective work around my assessments – with the main goal being (and how you put it) student ‘self-actualization’ of learning. I just received a Sandra Herbst book from Joe McRae and he has had experience with redefining assessment in his class. I look forward to learning more. @gnichols has also eluded to the richness of these resources. I am also trying to figure out how I can implement co-construction of rubrics and checklists to allow my students to better understand their learning journey. Lots to play with – love trying new things and seeing where they take me! Also potentially looking at throwing grades out for a unit – lots of fun! @gvoght, I am reading “Leading the Way to Assessment for Learning” right now by Davies and Herbst. “Students can reach any target that they know about and that holds still for them” (Stiggins) is a great quotation from that book, and underscores the utility of success criteria – sometime in the form of a rubric, and sometimes not. I taught for years in a system of giving students ONLY descriptive feedback, and no grades. 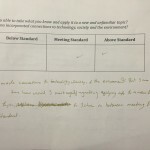 When students submitted an artifact of learning (like an essay or assignment) they did so with the rubric already filled out (no specific marks attached). I would then use that same rubric to deliver my feedback (as well as descriptive feedback in the form of comments or video). If there was a huge discrepancy between their assessment and mine, I used that as the basis of a discussion. It was really the process of holding that target still, and letting them get to know the target. Teachers can use exemplars, but a big part of the solution is providing that feedback in the moment through observation and conversation. That’s a great idea Garth. Having students hand in the rubric with their assignments/projects/assessment would be similar to setting up the reflection piece. It certainly forces them to delve into the rubric and fully understand where they stand whilst pushing them a bit more. In the sciences, I sometimes find the time needed for co-creation of a rubric challenging. This would fit in, with a redesign on approach and learning in the science classroom though. Thank you both for your comments on this – it’s leading to some new insights and ideas for moving forward with this action plan. Thanks for your thoughtful reflection about the use of feedback in your class. It has definitely left me with some ideas to help you move forward, coincidently Graham has commented on some of these more eloquently than I would be able too. If you’re interested I have a couple copies of one of Sandra Herbst’s Books on Assessment its a great short read with a lot of practical advice on assessment and learning. There is also much to aspire to here – I’m excited to push my students to reflect in a similar way more often. I think this is such a meaningful skill and one they need more practice to develop. If this hangout gets setup please look me up I’d love to hear about Doc Appender. Thank you for your comments Joe. 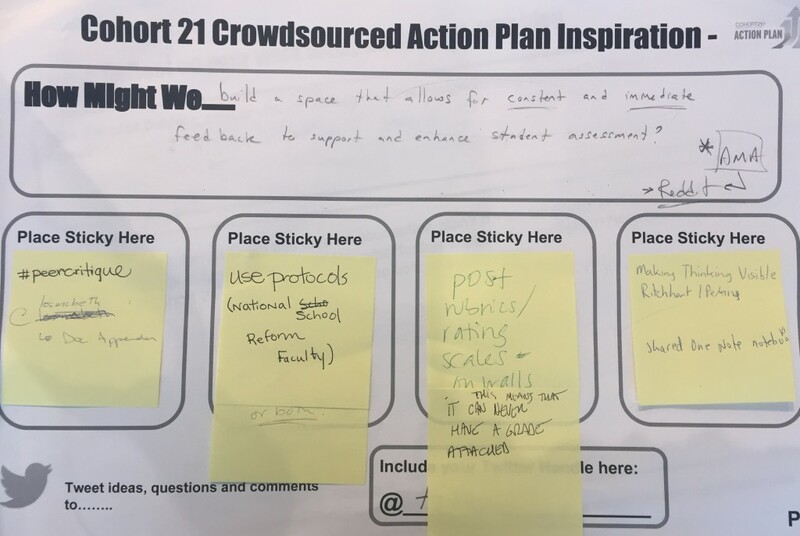 Glad to see you’ve been lurking around the Cohort 21 blogs! We should meet and chat about docAppender – I will keep you in the loop regarding the @lmcbeth and @ddoucet Google hangout on this. Also, I have heard about some of the strategies you have been using in your math class. We should chat more about this because my assessment/feedback could use some overhauling in that course as well. Please pass on the books – I’d love to check them out. All sounds great. I’ll try and drop off a copy of the Herbst book this week. Let’s definitely chat about docappender and assessment. Next collaborative time? I want in! Loved reading your post, TR, and especially enjoyed reading the student examples. They need more assessment like this. Would love to be included on future LCS collaborations that seek to redefine assessment here. The marks fixation in class is threatening to send me overboard. We need to start a personalized PD group on assessment. Joe, Derek, you, and myself are interested – we should approach others. 1) Don’t design assessments to meet all the needs of KICA. Design assessments with the overall expectations in mind. Check out the Hangout that I just did: https://plus.google.com/104517667538387919407/posts/3Gyhea2JquJ this may give you more inspiration. Can we start a book club with Berbst/Davies? Funny, I finally got around to watching the Hangout – I skipped ahead to the Product, Observation, Conversation piece and laughed because @ddoucet and I had the conversation today regarding this concept – throwing out the unit test. I am totally okay with throwing out the test – the place I get the most resistance in the sciences is at the student level. I also academic coach students at Trent University and on Sunday I had a conversation with them regarding exams. The student explained to me that their Lab Teacher at Trent University wished they would stop doing exams because it was not an authentic way of assessing – she then followed with ‘BUT’ the university does not allow it. Now Trent University is pretty progressive but they still struggle to ‘throw away the test’. I am all for throwing away the test but for the students sake (especially in the maths and sciences) I still value the skills learned and needed for their success in university. Simply put, I’m willing to throw the unit test out because I think they could learn better with more intentional assessments and feedback. However, a varied approach at the senior level may still provide them with the critical thinking approach and the skills needed for traditional requirements at the post-secondary level. In the end, I am still seeking to try a gradeless unit in the New Year and hope that the P.O.C. approach is how I can make this happen with plenty of student self-reflection and breaking down the overall expectations. Lots of conversation to be had! Thank you again for your very insightful comments. Book club started…at least at LCS. Go Berbst! I feel the discussion that your post inspired is so powerful Tim. Truly, assessment is a massive undertaking and is an exciting journey in our profession. There have been many intelligent and thoughtful comments so I will be simple: for me, the role of assessment is to allow the learner to show us what they know, rather than catching them at what they don’t know. What an incredible reaction! Welcome Joe McRae out of the lurking shadows and into the conversation – it’s much more rich with you in it! I love our conversations about assessment because I like to hear about life on the Math/Science side because it’s just great to know! Not sure if the DocAppender Hangout with @lmcbeth has happened but something I would like to participate in the New Year! You’re inspiring and what you’re asking your students to do is so powerful. I love how you jump in and change things at a moment’s notice if it will benefit your students. I am really looking forward to our PLC here at the school exploring assessment and how we can really push the enveloppe and get at rich and deep learning with our students. I have also been a lurker, but felt the need to comment on the thinking from you and your Co-Hort colleagues regarding assessment. To say that your thinking and the commentary that has been generated is impressive from a PD lens, would be an understatement. I wish we could bring our whole school in on the conversation because I think this would really strike a chord. In my opinion, there is nothing more important than assessing learning and communicating learning. At my old school (elementary level) we tried this and went with progress related comments only – a total shift away from “grades or percentages”. It took time on both the teachers part and in building parents’ understanding, but in the end, allowed us to focus on learning. Thanks for your continued thinking and reflection.